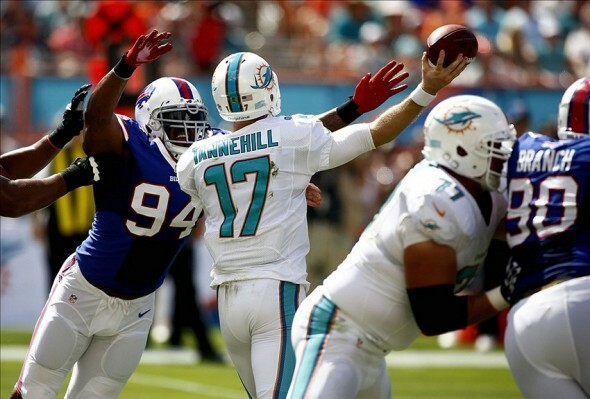 How will Ryan Tannehill bounce back form a shaky performance versus the Bills? Losses don’t get much more disappointing than what the Miami Dolphins suffered on Sunday versus the Buffalo Bills. It was a game Joe Philbin’s club should have had. It was a game they borderline needed to have. Instead, they gave it away to an inferior opponent. Three brutal turnovers — two of which led to 10 Buffalo points and one which prevented a Miami score in the red zone — squandered the team’s shot at its first divisional win of the season and a very respectable 4-2 start. But if the Dolphins can overcome their disappointment, a huge opportunity is about to present itself on Sunday in New England. Despite three consecutive losses, the Dolphins still, somehow, find themselves in position to make a run at the AFC East title. Beat the Patriots in Week 8 on the road, and suddenly every team in the division would have at least three losses. Suddenly, the Dolphins would resurface as a legitimate threat to win a division the Patriots have owned for most of the new millennium. This isn’t the obvious mismatch it used to be. While quarterback Tom Brady is still capable of carving up any secondary, his production has taken a noticeable hit this season with a depleted group of weapons to throw to. Yes, tight end Rob Gronkowski just returned to the lineup this past Sunday, but Brady wasn’t able to complete 50 percent of his passes for the third time of the season despite his return. And his 75.3 quarterback rating in 2013 is actually less than Ryan Tannehill’s rating of 83.1. But those numbers are skewed some. Brady still makes the big play when it’s needed the most and he seemingly always puts New England in position to win games. There’s a reason the Patriots are 5-2, after all. And the Dolphins’ secondary has conceded 269.3 passing yards per game, which ranks 25th in the NFL. Starting cornerbacks Brent Grimes and Nolan Carroll have covered well on the boundary, but Miami has struggled to match up with opposing tight ends, running backs and slot receivers. Brady will key on the Dolphins’ weaknesses all game and should continue to improve with a weapon like Gronkowski back in the fold. The Dolphins’ running game finally came to life this past Sunday versus the Bills, as Daniel Thomas and Lamar Miller combined for 103 yards on the ground. Week 8 will provide an opportunity for both backs to continue that success. The Patriots are currently allowing 127.1 rushing yards per game, which is less than only the lowly Jacksonville Jaguars. A slew of injuries has really damaged New England’s ability to stop the run. Star nose tackle Vince Wilfork is out for the season, as is tackling machine Jerod Mayo. Both players were instrumental in making life difficult for opposing runners between the tackles. The Dolphins must, must remain balanced on Sunday. A heavy dose of Lamar Miller and Daniel Thomas will be absolutely essential, as the Patriots must prove their ability to consistently stop the run without Wilfork and Mayo. Getting pass happy, even if the Dolphins fall behind early, would just be giving New England’s front seven a break. New England’s up-tempo running game has had success this season. A combination of Stevan Ridley, LeGarrette Blount and Brandon Bolden has produced an average of 116.1 yards per game, which ranks 13th in the NFL. The Dolphins, meanwhile, boast one of the stoutest interiors in all of football with three of the highest graded defensive tackles in the NFL, according to Pro Football Focus. Randy Starks, Paul Soliai and Jared Odrick have made generating push up front a tall order for opposing offensive lines. But less-than-stellar play from linebackers Philip Wheeler and Dannell Ellerbe (when healthy) has prevented Miami from fielding a truly dominant run defense. Both have struggled to fill running lanes at times this season. 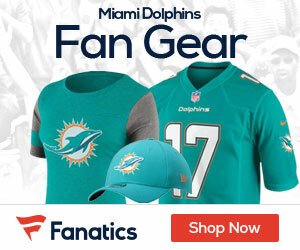 The Dolphins are currently allowing 102.8 yards per game, which ranks 15th in the NFL. Their ceiling is much higher than that, but they will surely be tested by a solid Patriots ground game in Week 8. Quarterbacks have struggled to throw on the Patriots’ secondary this season. Statistically, said passers have only managed seven touchdown passes to eight interceptions and their 225.6 passing yards per contest gives New England the league’s 11th stingiest pass defense. A big reason for that improvement has been shutdown cornerback Aqib Talib, who has virtually removed opposing offense’s No. 1 receiver during the game’s he’s played. Fortunately, for the Dolphins, however, Talib missed this past Sunday’s game versus the Jets with a hip injury. He did practice last Friday, which suggests he could play against the Dolphins. But it would be a huge break for Ryan Tannehill and Mike Wallace if Talib is a no-go for the second consecutive week. Five of the Dolphins’ first six opponents this season currently rank in the top 10 in sacks produced. The Patriots, however, are tied for 16th with 18.0 sacks on the season. It’s possible that Ryan Tannehill will have consistently sufficient time to throw on Sunday, which could allow him to bounce back after two dreadful first-half interceptions versus the Bills. Tannehill has only completed 51.9 percent of his passes during the past two games. He definitely needs to be more efficient in New England. The Patriots bring one of the NFL’s most disciplined special-teams units to the table. Kicker Stephen Gostkowski has split the uprights on 18 of 19 tries this season, punter Ryan Allen has produced the league’s fourth most punting yards and the Patriots’ kick and punt coverage has been solid thus far. The Dolphins, meanwhile, lead the league in punting average thanks to the boot of Brandon Fields, but kicker Caleb Sturgis has missed his past two attempts and the team is giving up the fourth most yards per kickoff return and producing the second fewest yards per punt return in the entire NFL.